Jimmy Kimmel has mixed the personal with the political as of late, making a moving point about health care while sharing the story of his newborn son’s congenital heart defect. But upon hearing the news of Donald Trump’s firing of James Comey, the host just went straight for the punchlines. In last night’s monologue on Live!, Kimmel espoused his theories that Comey got canned because a) Trump believes the White House is The Celebrity Apprentice and b) the now-former FBI director’s role in the Hillary Clinton email investigation helped Trump get elected. And, man, does Trump hate being president. “This is the kind of thing dictators do. This is the kind of thing reality TV hosts do,” he explained. “They fire someone every week. Maybe that’s what happened. 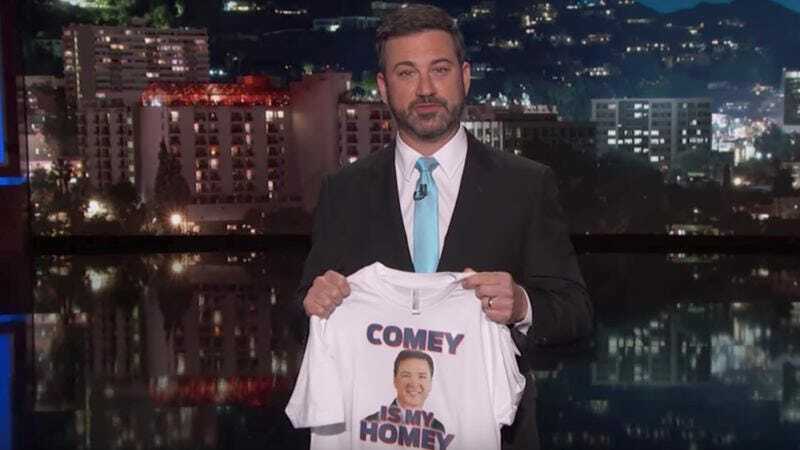 He thinks he’s still on The Celebrity Apprentice.” Kimmel also debuted a “Comey Is My Homey” T-shirt, which his team obviously had made up at a moment’s notice.